Food | Finding My Inner Athlete! B is for BUMMER! Sad for my friend. And, I’m at a bit of a loss for suggestions that will be helpful. That is why I am bringing this to you. You see, I’m single. I struggle with eating in social situations and sometimes it is a bit difficult to bring things up with my extended family, but I get nothing but support when I do. They are even willing to try what I am doing on occasion. It’s just not the same as trying to help an immediate family member(s). I’m not responsible for fixing anyone’s meals but my own. I need your help! Do you have some advice for my friend? So many of my habits, especially those surrounding food and exercise are seemingly “involuntary.” They have become entrenched in my everyday routines and I simply do them without much thought. Trying to flip those routines to include the opposite of what I have been doing is very overwhelming. Especially when I don’t feel well and I imagine that compounds when there is major push back from those with whom you live. (Side note rant: I don’t say that as a means of excusing bad habits, just a simple statement of what is–an explanation if you will. And in my book, the different between an excuse and an explanation is action. If one talks about not feeling well and being overwhelmed and then does nothing it is an excuse. If they explain that they don’t feel well and that they are overwhelmed and then they still take action–totally just an explanation of what is and what they need to overcome. It’s like saying, “See this mountain? It is in my way and I need to get to the other side. Here are the things I’m going to do to get over that mountain, and then doing those things.” If we weren’t trying to do something about it then maybe the excuse word would apply. But we are making our way up that mountain, so its totally just description of the terrain.”) I have to be very deliberate about operating outside of those entrenched, seemingly involuntary habits. And…there are many of them. Trying to change more than one of them at a time is daunting. And I can’t imagine how much more daunting it would be if I were trying to change the habit of my family all the while dealing with their resistance. So, my dear friend, I think you are doing an amazing job. From our recent conversations I see you trying to work more healthful food into your family’s diet. I see the concern that you have for making things better for those you love and I applaud you. I know that you don’t feel well and that makes it all the more difficult. My heart breaks for your current dilemma. However, I know that you are strong and resilient! I believe with my whole heart that you can do this if you take it one step at a time. I know that is hard when you see someone you love suffering. And you are scared! And you realize that things need to change but you can’t find the right way to get the whole family to understand the importance of making these changes. I know that you want to make 100% of the change at once so that you can see him progress and feel better. I know you fear for his life. But…make the changes one at a time so that they are sustainable and your family isn’t overwhelmed. Be a good example in the things you are asking of them. They will come around. And who knows, once you have a succession of baby steps you may find yourself (and your family) speed walking or even running (metaphorically). One of these days your family members will start to notice that they feel better and they will be on board with the new eating habits you are trying to instill. I wish I had something more concrete to offer you. I hope that my friends reading this post who have dealt with similar situations will chime in and offer you some useful advice. I’m sure many of them have been where you are now. Plan of Attack for May! Hello friends! I find myself at the end of another month without much to say for my efforts during the previous month. Life is busy. I’m prepping to sell my house. I’m getting ready to go on vacation. Work has been so busy. I haven’t felt well. Do you hear what I’m hearing? If you thought EXCUSES, then we are on the same page. One thing I need to remember and realize is that there will ALWAYS be something that I can allow to stand in the way of my plans. Or, I can find a way to work around it or even incorporate it into my efforts. This path I’m on (getting fit and finding this athlete within) will not be a simple walk in the park. If I wait until there aren’t other things vying for my time or until I feel completely awesome, I will die an early death and and need an extra wide coffin. I’m not O.K. with that! I’m choosing to focus my efforts in May on nutrition. One good healthy habit. In May, I will be joining the Love Your Greens 30-Day Challenge hosted by The Unconventional Kitchen. Even while on vacation I can manage to get in one delicious green smoothie per day. I’ll be posting pictures and recipes along the way and will have beginning of the month and end of the month stats (weight/measurements) along with a summary about how I feel after completing the challenge. If anyone is interested in doing the challenge, you still have a few days to sign up. It starts on May 1. Even if you don’t want to do the challenge, I encourage you to check out Desi’s website. She has great information and awesome recipes–even some great ideas for those with picky eaters in their families. I’m not setting any specific fitness goals for the month other than to take the opportunity to get out and walk or do active things with friends whenever my schedule will allow. I have some great things in store as we move into the summer on the fitness front. 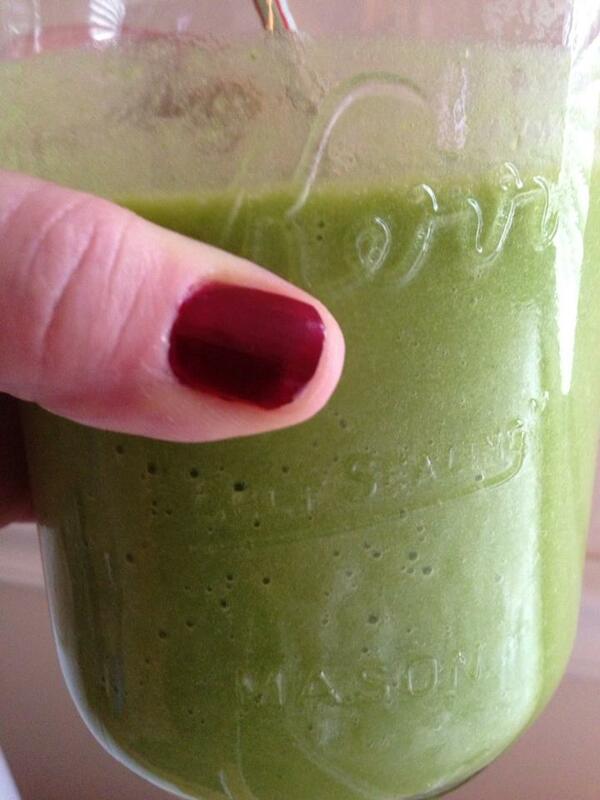 I do love a green smoothie so I’m WAY EXCITED about May!